The MultiPro Tailgate has six different positions making it easier to load items into the truck bed, making it easier to reach items in the truck bed, and a built-in solution if you need to load stop. The tailgate can even be folded to provide a standing desk of sorts or work station. There is even a built in handle to assist you if you are using the tailgate as a step. Too often, the GMC Sierra was viewed as just a twin to the Chevrolet Silverado. The Denali version is more luxurious, but the MultiPro Tailgate is truly a luxury as well. It will be interesting to see how it is viewed by customers. GMC is making sure that the 2019 GMC Sierra Denali is loaded with all of the options to compete with top of the line Ford F-150 King Ranch or Platinum models. All of the top of the line truck models now have premium interiors, featuring beautifully detailed leather seats and higher grade finishes. The Sierra Denali is offered in a crew cab configuration adding 3” of leg room for the rear seat passengers. The GMC Sierra Denali also boasts of having the most powerful V-8 engine available. The 6.2L V-8 engine is rated at 420 horsepower 460 lb-ft of torque. It is paired with a 10-speed automatic transmission. The Sierra Denali also offers Adaptive Ride Control which is supposed to offer the driver greater control and a smoother ride. There are also traction control settings allowing the driver to adjust for different weather, road or even offroad conditions. The GMC Sierra Denali will also be introducing the first carbon fiber pickup box. It won’t be available until later this year, but when it does arrive it is promised to offer the best dent, scratch and corrosion resistant truck bed. 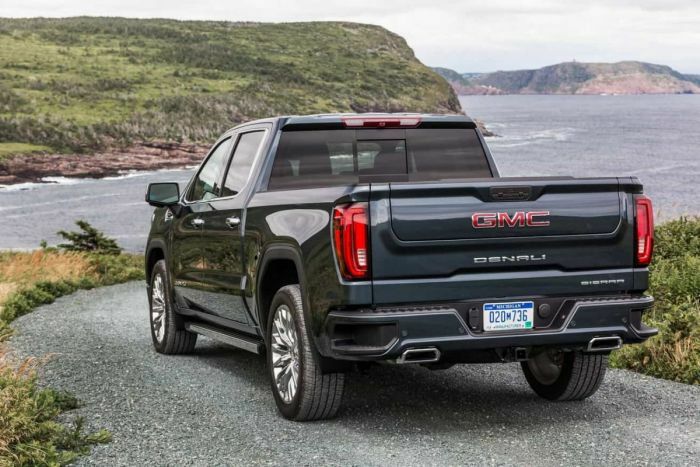 The 2019 GMC Sierra Denali is also debuting GMC’s new ProGrade Trailering system, which is designed to make loading and towing a trailer easier. Drivers will also have the option of using the traditional rearview mirror or a rearview camera mirror display. The rear view camera can often give a better view and not be blocked by passengers in the backseat or cargo in the truck bed. The system also lets the driver zoom and tilt the camera for a better view while backing up. The 2019 GMC Sierra Denali also is loaded with lots of premium bells and whistles, like infotainment, improved connectivity and a heads up display so information appears right in front of you. But the big change on the 2019 GMC Sierra Denali is the new 6- way tailgate, and it will be up to buyers to decide if it is an interesting gadget or the new must-have in the pickup wars. Eventually, I would expect to see the new tailgate technology on the high-end Chevy models as well. You can compare the 2019 GMC Sierra Denali to its competitors here.